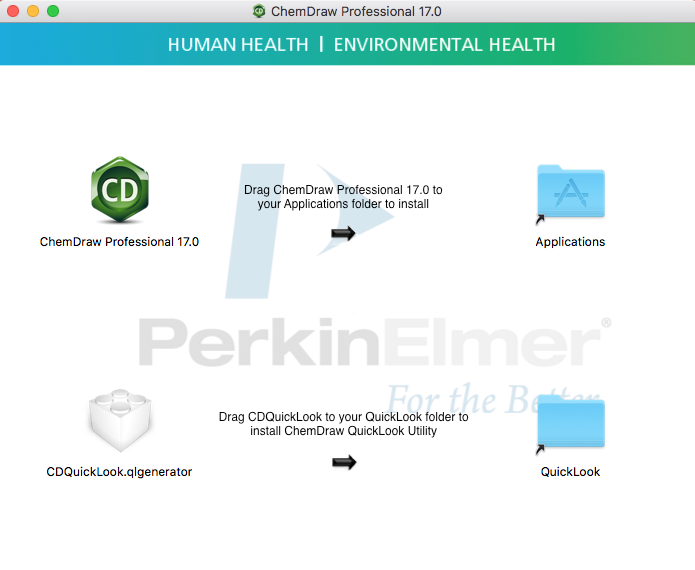 Once you've followed the other instructions to downloaded an installer from Perkin Elmer for the ChemDraw Pro software, follow these steps to install it on your computer. Double-Click that file to open the disk image. It will appear on your desktop. Double-Click the installer file on your desktop to open it. Then, as instructed, follow the arrows to drag the application icons to the shortcuts for their respective folders, 'Applications' and 'QuickLook'. Close the installer window, and drag the disk image file to the trash. 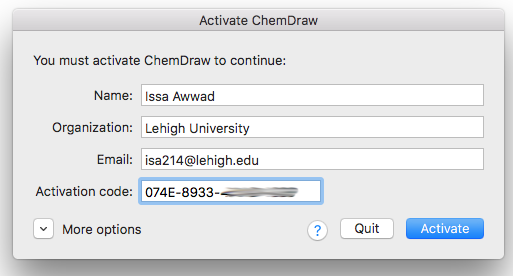 Find and double-click the ChemDraw Professional 17.1 program icon in your Applications Folder. At first run, the program will request your email address and the registration code for the software. Be sure to use the email address you registered with Perkin Elmer, and the Lehigh registration code, as listed in your email.